While I have been a fan of Carelia’s amazing style for years, her Instagram Stories are what made me want to move to North Carolina and be her BFF. Carelia’s motto for life is #DRESSFUN but her Stories show she also believes one should #LIVEFUN. She shares her workouts, her cooking (great for those who are gluten free but want creative and flavorful dishes), dates with her adorable husband, and deep dives into her closet and how she keeps it small yet so colorful and creative. 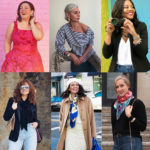 Carelia really dives into the why for her wardrobe, why she chooses to buy certain brands, certain colors or silhouettes; why she removes certain items; why she added certain items to her to-buy list. It’s a great way to learn how to curate one’s own wardrobe. Jamie is a woman who knows how to make any situation fun, and isn’t afraid to poke fun at herself. She has a passion for fashion, isn’t afraid of a statement coat or a bold piece of authentic Native American turquoise jewelry. Get peeks into her amazing closet, her everyday life in New Mexico, and behind the scenes as a blogger and influencer. I’ve had the pleasure of meeting Jamie and she’s just as vibrant and fun in person! Okay, I may be biased because Rosana is a good friend in real life, but I did meet her through social media. And even though we are real friends, due to our crazy schedules we connect more through our phones than face to face. Rosana shows the real life of being a personal stylist. I love when she shares an item from a client’s wardrobe that is unique and sentimental and she finds so many amazing ways to style it in a fresh and modern way. She shows the hard work and the care that goes into her closet audits and style pulls and the relationship she has with her staff. She also shares time with her adorable family, showing how she balances being a business owner with being a mom of three. If you want to know where to go, where to eat, where to stay in DC you must follow Sylvia. She’s a friend in real life, and my guru for all the coolest, tastiest, and chicest in our Nation’s Capital. She also regularly hops to NYC and Paris and shares her travels. She’s a woman who can mix Gucci with H&M and truly make it work, and isn’t afraid to share the behind the scenes of what it takes to capture the gorgeous photos on her feed. Want a dose of vibrant positivity that isn’t saccharine sweet? Follow Tonya. Her stories constantly uplift me while remaining relatable and entertaining. As an ambassador for O the Oprah Magazine, she gets to try cool products and go on amazing trips and is great about sharing them with readers in a way that is informative and fun without causing jealousy or FOMO. Fashion, beauty, and family life all with a gorgeous smile. I’ve had the pleasure of meeting Tonya more than once in person and she’s the same smart, stylist, and sweet woman you see on her Stories. Dina isn’t an influencer, so I felt a bit weird sharing her here. Many moons ago she was a blogger but moved to the business side to help companies look good and has worked with some of the chicest brands out there. She has a great eye, and her Stories are full of shots from her life in NYC and her trips to places like Istanbul and Tulum. If you like cats, cooking, politics, skincare, and fabulous shoes, you’ll likely love Dina as much as I do. Detroit-based Ashley is another woman who makes me want to move and become her BFF thanks to her Instagram Stories. Real-life talk before and after her visits to the gym (I kinda sorta totally want to copy her GYM HAIR hat), new closet additions (again she’s big with the why which I love), family life, and bunny life. Yes, she has a pet bunny. I never thought I’d want a pet bunny until I saw her Pippi Lou stories. Ashley is a full-time working mom with a classic personal style (think J. Crew and Everlane with the occasional splurge of an Hermes scarf or Chanel bag) and a dry witty sense of humor and I always look forward to her Stories. I found Nickie when she commented on one of my Instagram photos saying she grew up in a city not far from me. So glad she left that comment because she has quickly become one of my favorite people to follow on Instagram. As a professional personal stylist, she regularly offers style tips and explanations behind her looks. She’s so darn funny, her feed as well as her Stories regularly cause me to laugh out loud. Her heart is so big, her town was severely impacted by Hurricane Michael and she has done so much to fundraise and help her neighbors even though she and her family lost almost everything. I also love the relationship between she and her husband; it’s so real and relatable. I love Beth’s blog and Instagram feed for chic classic fashion with an edge. But I adore her Instagram stories because she takes her great style beyond the closet. Fitness, food, home décor, her adorable dog and cat, and much more. Beth keeps it real and shows doable ways to make every aspect of your life stylish. Her Stories also showcase her wit and you get the occasional peek of her fab husband known as Mr. Style and her adult sons. She’s gorgeous, she’s fashionable, she’s a model and a world traveler. Grece’s Stories are almost as beautiful as her feed, but I love how you see her life from her perspective. From shots from photo shoots to her life in Montreal, Grece gives you an inside view into her daily life. I must say her workouts are my favorite, as a previous personal trainer she has great form and in her Stories you can see the technique and she often shares how many reps, the weight she’s using, and more. Grece and her equally stylish daughter Cheyenne travel together often and Cheyenne is often the person behind the camera, capturing Grece at events and in the gym. Grece proves age is but a number and you can be fit, fashionable, and fabulous at any age. I had to include myself! I use my Instagram Stories to share the behind the scenes of my everyday life. A lot about skincare, some about the business of blogging, outfits that don't make it onto the blog or in my Instagram feed, and I love sharing my travels and events I attend (concerts, dinners, festivals, and more). I also share a lot of accounts, meme, and images that I see in my feed that inspire me. I love connecting with all of you in Instagram comments and DMs and look forward to interacting with you soon! 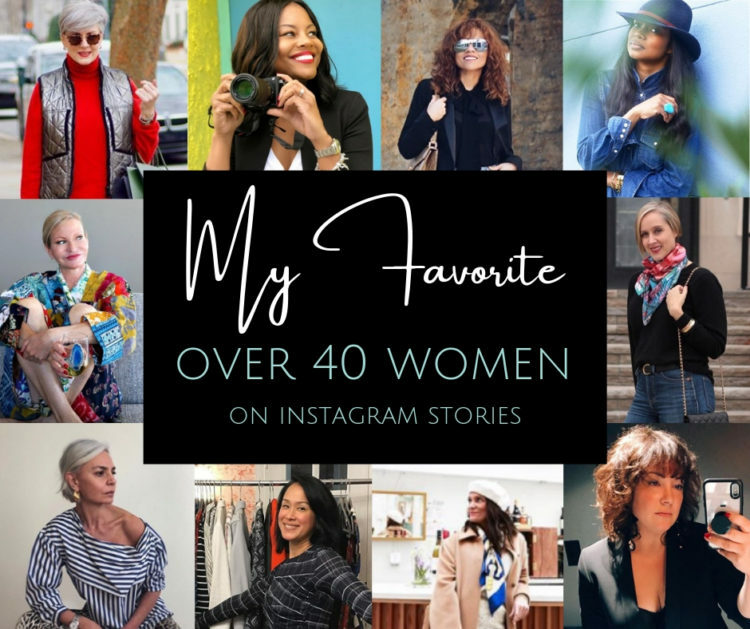 Do you have any favorite over 40 women on Instagram Stories that aren't mentioned here? Do share them in the comments! Ha! I wondered where my new followers were coming from. Thanks for including me in such great company! LOL sorry for no heads up! But thank you for having such a great eye! Great recommendations! The Real Chic Life is a very uplifting blog, will have to check out the other ladies mentioned. Thank you so much for featuring me! I loved reading about all of the other women you shared about here as welll. Wardrobe Oxygen is hands down my favorite blog, so this is quite an honor. You are the real deal my friend! Thank you so much for the intro to so many lovely and interesting women, but especially for Nickie Taylor! Oh I’m glad you like her, she’s pretty fantastic!